Bangalore: A Supreme Court-appointed committee to survey 42 iron ore mines in two districts of Karnataka has cleared only two mines for resumption of operations and will decide on a third in a few weeks. Iron ore production in India has slumped after the Supreme Court banned mining of the commodity in Karnataka, the country’s second-largest producer, this year owing to environmental concerns. “The joint survey team deliberated on the findings of the field survey and decided to clear only two mines for resumption of operation," said a forest official who participated in the survey operations. The official declined to be identified for this report. The panel, which completed the assessment last week, has cleared a private mine each in Chitradurga and Tumkur districts, said another person who participated in survey operations. The survey was ordered by the apex court following a petition by Samaja Parivarthana Samudaya, a non-governmental organization, against illegal mining in Karnataka. Chitradurga saw a peak production of 6.5 mt in 2008-09, and Tumkur 2.5 mt. Along with Bellary’s production of nearly 40 mt that year, the three districts accounted for nearly 25% of the country’s iron ore production. After Karnataka banned exports of iron ore in July 2010, production of the steel-making commodity in Bellary dropped to 25 mt. In Chitradurga and Tumkur, combined production dropped to about 7 mt. In Bellary, the joint survey panel cleared 24 out of 99 mines for resumption of operations in September. Production can resume only after a final order from the Supreme Court. Sesa Goa’s Narrain mine was named in a central empowered committee (CEC) report in August for having dumped mining waste in private land outside the lease area without permission. Sesa Goa declined to comment on the joint survey team’s findings. 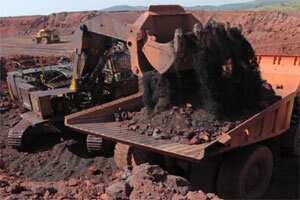 According to a Press Trust of India report in October, Sesa Goa hoped to resume production from this mine in early 2012. Sesa Goa shares have dropped about 40% this year, compared with the Sensex’s 20% fall. On Thursday, Sesa Goa’s shares ended at ₹ 192.45 each, down 4%, while the benchmark index lost 1.87%. The forest official mentioned earlier said the survey team will now begin classifying the defaulting mines as those with serious and non-serious violations. The CEC will recommend to the apex court that mines with non-serious violations be allowed to resume mining after paying fines and going through a complex process of so-called reclamation and rehabilitation (R&R) operations. Mines with serious violations will have their licences cancelled. These too will have to pay fines and be part of the R&R operations.